I printed the boards on white cardstock and set out some purple pompoms. To start with I just gave boards 1-5 to F. He called out the names of the numbers (wah, two, ee, orr, eye) and I showed him how to put the pompoms in the gaps in the numbers, counting as we went. 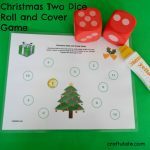 Over the next few days we played with these several times – sometimes he just liked to call out the numbers on the cards, other times he would start to learn the sequence of the numbers by helping me count the pompoms as I placed them onto a board. I think we’ll get lots more use out of these! 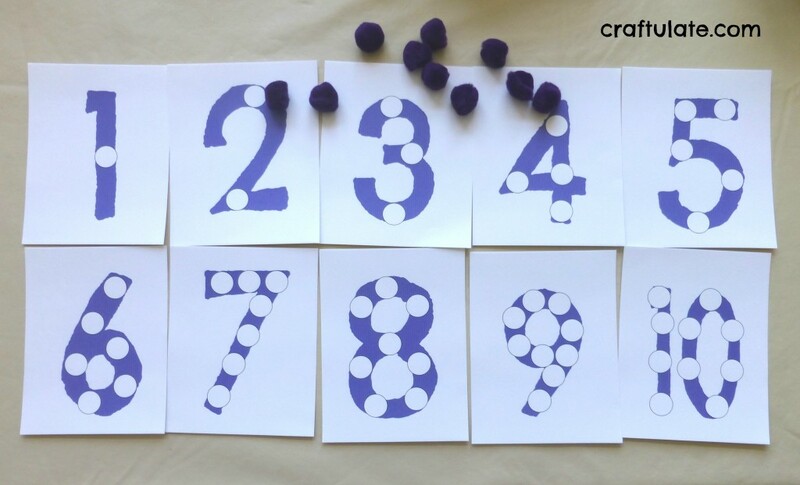 If you like these number boards then head on over to the Craftulate Shop to get them for FREE! Available in black (for colouring) or purple. They also work well with play dough and dot markers! Print onto 5 sheets of white cardstock, then cut in half and trim to size if desired. If these cards are likely to get a lot of use then you may like to laminate them or cover them in contact paper. This activity was part of our Purple Crafts and Activities week. I don’t see a link for the printables. I also went to the “purple” site. Can you help me or send me a direct link? Thank you so much! There’s a link in bold to the Craftulate Shop towards the bottom of the post – that’s where they will be. Let me know if you’re still not seeing it.